French writer Marcel Proust was the inspiration for a Nov. 5 concert in Brookline. One night in Paris in the winter of 1916, at around 11 p.m., the distinguished French violinist and quartet leader Gaston Poulet was already in his pajamas when the doorbell rang. He opened it to find perhaps the greatest chamber music fan in literary history standing on his doorstep. “I am Marcel Proust,” the man announced. It so happened that the not-yet-celebrated novelist was extremely keen to hear a performance of Cesar Franck’s String Quartet in D major that very night. He had a taxi waiting. If Poulet agreed, perhaps they could quickly round up the other members of the quartet, bring them back to Proust’s home on Boulevard Haussmann, and have an impromptu private concert? Off they went. According to Proust biographer William Carter, who recounts the scene in detail, violist Amable Massis, hesitated upon entering the taxi, apparently confused by the sight of the pale author, swathed in a giant down quilt, sitting with a bowl of mashed potatoes nearby. But he was duly reassured, and on they went. The concert, Carter recounts, took place in Proust’s candlelit bedroom, his manuscripts stacked in plain sight, the author listening with eyes closed while reclining on a green divan. When the ensemble reached the final bars at around 2 a.m., Proust opened his eyes and requested that they start all over again. Proust, we are told, was a natural listener, one who “drank in music effortlessly.” And as his housekeeper Céleste Albaret described, the music penetrated somewhere deep. 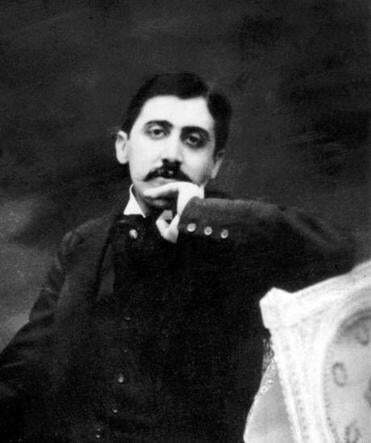 After the private concert, she recalled, Proust “was transfigured and lit up from within.” He was also fortified for the artistic work that still lay ahead: completing the novel of the century. Across the pages of “In Search of Lost Time,” Proust ultimately repaid (and many times over) whatever debt he owed to music. The Boston attorney James Connelly has in fact assembled a kind of user’s manual to the musical references that populate the novel — and this reference document itself, at 171 pages, stretches toward novelistic lengths. But Proust did more than just drop the names of works by Beethoven, Wagner, Chopin, and Fauré into his pages as a kind of period scene-setting. The novel also includes profound meditations on the poetics of listening. Indeed, Proust gave voice to the interior experience of perceiving music as no one else had done before him. Given all of these connections, coupled with the general hunger for imaginative thematic programming, it was hardly surprising to find St. Paul’s Episcopal Church in Brookline packed to overflowing last Sunday for a Proust-themed concert presented by Mistral Music (Julie Scolnik, artistic director). Short readings from the novel — including descriptions of the famous “little phrase” from the Sonata by Proust’s fictional composer Vinteuil — were interspersed with performances of works by key composers in Proust’s universe: Chopin, Fauré, Franck, Wagner, Beethoven, and Debussy. The atmosphere in the church, despite the size of the crowd, was intimate, suggesting something closer to a salon concert than a standard-issue chamber event. And the performances themselves were persuasive, especially pianist Max Levinson’s thundering account of the “Liebestod” from Wagner’s “Tristan und Isolde” (in Liszt’s dazzling transcription), and a warmly attentive reading (by Sarita Kwok and Qing Hou, violins; Lawrence Neuman, viola; and Jan Muller-Szeraws, cello) of the slow movement from Beethoven’s celebrated A-minor String Quartet, Op. 132. The Beethoven in particular remains a formidable test case for anyone who has even dabbled in the rather Sisyphean task of finding words to evoke the wordless art of music. Put simply: with Op. 132, there are none that do the trick. The work’s so-called “Heiliger Dankgesang” in particular is a desert-island slow movement, music of such vertiginous beauty and spiritual power that attempting to summon it onto page or screen feels futile at best. But this is also where Proust steps in to help. In truth, the musical descriptions from the novel, including those of the “little phrase,” often convey varying states of reverie more tangibly than they convey actual music. Especially when the character Swann is doing the listening, we are swept into his own febrile intoxication through sound. That said, in the novel’s fifth volume, “La Prisonnière,” the narrator, Marcel, attends a performance of Vinteuil’s Septet, and it is here that Proust proves himself once more as the great guide to art’s ineffability. Or at least, from concert to concert? On Sunday evening, the response from Mistral’s audience was grateful — no doubt for the performances themselves but also perhaps for the literary reminder: When it comes to “possessing other ears,” if not to interstellar travel, Proust’s narrator had Vinteuil. And we, to this day, have Proust. Jeremy Eichler can be reached at jeichler@globe.com or on Twitter @Jeremy_Eichler.